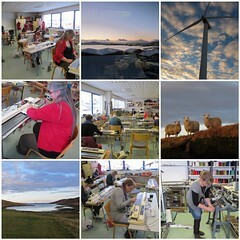 An amazing 5 weeks in Shetland working at Shetland College on the BA Contemporary Textile course. I was a visiting tutor on the machine knitted textile module with the 1st and 2nd years. These students are ones to watch. The Shetland college is surrounded by a wealth inspiration of dramatic land and seascapes, wildlife, traditional arts and crafts and fibre.